In medieval Europe, when a man vanquished his enemy, he killed the enemy’s wife, the enemy’s children and any other kin he could find. It was brutal; it was terrible. But it was done so that the enemy’s family would have no support, strength or even knowledge of who the man was. So that no one else in the enemy’s family would take up the mantle of revenge upon him or the next generation. Destroy the family, they knew back then, and you destroy everything. America in the 1940s was no different. Malcolm X’s father, Earl Little, was a pivotal figure in the fight for black rights. In X: A Novel, co-author Ilyasah Shabazz—the third daughter of Malcolm X—recounts how her grandfather “was instrumental in getting Garvey out of jail” and “circulated the petition against the government for violating the human rights of Negroes in the United States.” So Earl was attacked. First the Ku Klux Klan burned his house down, and when that failed to stop him, KKK members killed him one night. Afterward, Malcolm’s mother kept their family afloat during the Great Depression by working whatever jobs she could find and educating her children in the strength and beauty of black people. But the local government systematically harassed Malcolm’s mother until she finally lost her job when outed as black. With his mother out of work, the government took Malcolm and his brothers and sisters away from their mother; she was later incarcerated in a mental institution. They were taking no chances that one of the children would rise up and take on the father’s mantle working for African-American rights. Destroy the family, destroy everything. And for a long while, it looked as if this attempt would be a success. When we first meet Malcolm X, then known as Malcolm Little, in X: A Novel, it is 1945 in Harlem, and Malcolm is running for his life from West Indian Archie, the crime boss who employs him. The long line of bad decisions Malcolm has made while fleeing the pain of his father’s murder, a broken family and everyday American racial violence has gotten him here: in a dingy bathroom with an armed gunman seconds away. How could this have happened? This is the question X: A Novel answers through a vivid portrayal of the formative years of Malcolm X’s life. We see the pain of a frustrated life eating at Malcolm and we wonder: Will he find a way to channel his intelligence and drive? Or will the constant injustice beat down on him, destroying him as it has so many other talented, beautiful black girls and boys? Because we know Malcolm Little survived to become Malcolm X, the great thinker, leader and activist for African-American rights, the suspense lies not in the if but in the how. In a lively first-person narration, X: A Novel weaves together Malcolm’s childhood and young-adult life to delve deep into the psychology of his personality, exploring how the weight of his father’s activism and violent death was instrumental in Malcolm’s own civil rights work. This debut novel by Shabazz, co-written with Kekla Magoon, is an intimate imagining of Malcolm X that humanizes the great leader and makes him accessible for readers of all ages. 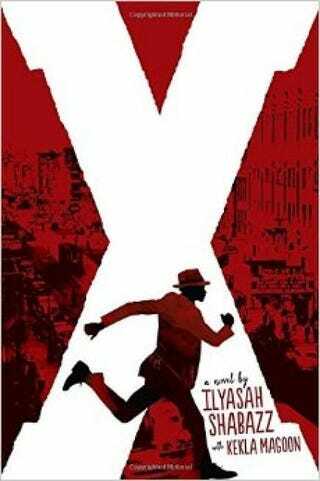 Set against the horrific racial violence suffered by African Americans in the first part of the 20th century, X: A Novel is a powerful coming-of-age tale of going out into the world, getting lost and finding yourself. Here, Shabazz crafts a love song to her father and to all the little black children of that time whose potential went unrealized because of segregation and discrimination. Malcolm, like many other black boys and girls growing up in segregated America, was a straight-A student who dreamed of being a lawyer before his teachers told him “he was just a n—ger” who would amount to nothing. By the time Malcolm leaves his foster family in Lansing, Mich., to stay with his half-sister, Ella, in the upper-class black Boston neighborhood of Sugar Hill, his dreams are dead. He has trouble connecting with the more privileged Sugar Hill blacks, who, to him, deny the stifling realities of racism. He heads down to Roxbury, “where people are looser” and “where all the action is.” Malcolm falls in with Roxbury scenester Shorty, who gets him a job as a shoeshine boy. The old Malcolm is unrecognizable to his new self, with his new fedora, zoot suit, freshly conked hair and ability to party all night. And that is exactly the way he wants it. He is still running—from his memories of his dead father, from the voices that call him “n—ger,” from the odds that are stacked against all black boys trying to become men. How can he be the man his father was, the man his father raised him to be, and not also end up being killed by white people for being “too uppity”? Malcolm has no answer, so he keeps running—heading full tilt for self-destruction with dangerous drugs and dangerous women. When World War II opens up the enlisted white men’s jobs in the States to blacks, Malcolm gets work on a train line. Able to travel and see more of the world, he sets his sights on New York City. There, Malcolm’s talents captivate a crime boss named Archie, and Malcolm joins his racket as a number runner. But after Archie becomes convinced that Malcolm has scammed him out of a deal, Malcolm flees back to Boston for safety. Malcolm, however, doesn’t see this as a sign to change his life; instead, he accepts an ex-girlfriend’s invitation to join her thieving ring. But it is Malcolm who gets caught. Given eight to 10 years in prison, Malcolm at first acts out, until an older black Muslim, reminiscent of Malcolm’s father, takes Malcolm under his wing. In being mentored by this man, Malcolm rediscovers his love of reading and thinking. In the stillness, in the reflection, he heals and makes peace with his father’s death. We see Malcolm rediscover his childhood spirituality in the new form of the Nation of Islam. We see Malcolm becoming the man he is meant to be, the man who will change the world.